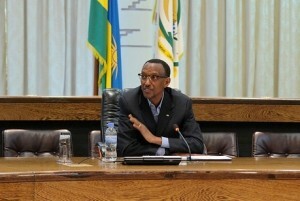 Rwandan president Paul Kagame this Thursday February 2nd chaired a Press conference in Village Urugwiro located in Rwanda’s capital city of Kigali. It is the first meeting of this kind this year. Highlighted issues included: Justice, military, Education, and economic issues. Kagame started by answering questions of current RDF senior soldiers (Rwanda Defence Forces) facing suspension and under house arrest. He explained that anybody who would do contrary to the law will not be tolerated and held accountable. He added that the soldiers were arrested for conducting business dealings with civilians in neighboring countries, an action he said was against principle and ethos of the RDF. Based on the outcome of the 2010 presidential election, Rwanda’s head of state said that Rwandans knew what they want and could not be lured into overthrowing the government they elected into power through a coup d’état. During the press conference President Kagame lauded the result of an report by French judge Marc Trevidic and his colleague Natalie Poux. He said the report would remove any doubt based on political benefits to accuse RPF Inkotanyi of killing former Rwandan President Juvenal Habyalimana. President Kagame castigated individuals who criticized Rwanda’s achievements especially those who accuse Rwanda to undermine human rights, and press freedom. As regards to Africa’s problems, President Kagame said it was pathetic to have such problems, given the continent’s abundant resources. He said that in order to solve those problems tangible partnership amongst African countries were required.